My dear friend and partner in administering Ecclesia Classes suggested I teach modern dance for the 2017-2018 school year. Two weeks before the semester was to begin, there were only three students registered. The other five high schooler girls who were eligbile for the class had registered for the strength building class, offered at the same time. Feeling insecure, I suggested we move my three students into that class and cancel modern dance. My administrator and friend instead said, “No, let’s talk to the other high school girls. They need to take this class. Let’s call and ask the girls to switch. It will be great to have all the girls together in a class. The strength building class can be for the middle and high school boys.” I hesitated but went with it. Each girl readily chose to switch to dance when asked. After that, two other girls registered for the modern dance class on their own. So, I had ten lovely middle and high school girls to work with. I hadn’t tried to connect the words with the movement. I hadn’t even choreographed with the song in mind. I just enjoyed playing with choreography and, in the end, it worked beautifully with the song. It was seamless and almost effortless, not like I didn’t do my preparation and my part, but there was no wrestling. It felt like the Lord had just given me the dance. And it was so beautiful, so much so that I think it surprised the girls and their parents. And it was moving. It gave me so much joy, but I also felt like it wasn’t something I could replicate. So, entering the second semester, I didn’t know what we would do for a presentation dance. I had a couple of fuzzy ideas. I wanted to have something where the girls choreographed some portion of it themselves; I wanted to use some spontaneous unison movement, and I wanted to use prophetic veils. But as the semester progressed, I didn’t get a firmer vision. We played with another song that I thought might work, but it never really became a dance. I remember a conversation with one of the students’ moms who was so looking forward to our end of year presentation because she had been so moved by the first one. I told her that that dance was unusual, that it had come together simply and gradually (so the girls really knew it well) and that I wasn’t even sure what we would present. Then, in March, I choreographed a solo for Palm Sunday. (You can see it here) The choreography process was actually kind of grueling for me. But the Lord did bring the dance to completion, and it was a joy to dance. When I finished it, I knew I had my group dance for my girls. I could see how I would modify it for a group and how the modifications would add interest and power to the choreography. So, in eight fifty-minute classes, the girls learned the choreography. I added a part where the girls had the freedom to choreograph. And we had a section for spontaneous movements led by a couple of them. I could see the beauty when they practiced, and it was a joy to have them excited to share it. 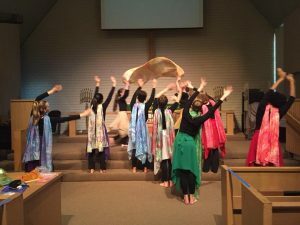 The biggest thing I learned is that the Lord really does provide choreography. I know that sounds obvious, and maybe you have already internalized that truth on a deep level. But I feel like He has shown me, in a new way, that He truly will provide choreography, and he has tutored me in how He does this. There is a point in preparing for a ministry assignment or choreographing where I cannot see the true value of what I’m participating in. I cannot envision the end result and I’m not satisfied with what I am able to create. But He is showing me that, while that stage is part of the process, it’s simply a stage, not evidence of my unfitness for the assignment. As I walk with Him, He provides. The timing is His. I can cooperate with Him so that I’m ready to receive it when He gives it (and He has grace for the times when I fail to cooperate well), but the timing is His. There comes a moment (or a series of moments) when He provides the dance. Sometimes that moment comes after a time of listening, playing or laboring with movement, and sometimes it comes at the end of another assignment. And sometimes it comes in a series of moments. Whatever the case, He knows what He is doing, and when He adds His measure, we get to be part of something glorious. It’s not about us, but we play a part in it. I’m speaking in the first person here because this lesson was personal to me. But I share it in case you can see yourself in my story and can gain encouragement for when you are choreographing (or preparing to teach, or writing a book, or creating flags, or whatever assignment you are called to at the time), knowing that He has called you to work with Him. He will use your experiences in ways that surprise you, and He is able to take what you have and make something beautiful and impactful from it. Here is the dance. I pray that He adds His measure when you watch. Hosanna mixed version Ecclesia from Amy Tang on Vimeo. Thank you, once again, for taking the time to enter into my story and for letting me be part of your life. I would love to hear from you. 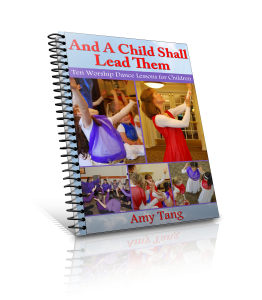 What have you learned about how the Lord provides choreography for you? Do you have a story of a time you labored hard and yet were surprised by the impact your work had because you saw the Lord add His measure? Do you have questions about co-laboring with the Lord as you create? Lastly, if you love these veils and what they add to dance, you can learn more and purchase one here. Always outstanding! Love the variety of movements n multiple ways of using the veils. I have not danced nor practiced with the group since nov. 2017. I’m excited to b going to a conference next month! Thanks, Diane. So glad you get to go to a conference next month. Be blessed.